Cleaning your carpet is not only a cosmetic necessity if you want it to look good, but it’s a sanitary necessity as well. There are some "do’s" and "don’ts" when considering the correct way to care for the carpet, but below is an outline of the best, most healthy and sanitary, way to care for your new and even dated carpet. 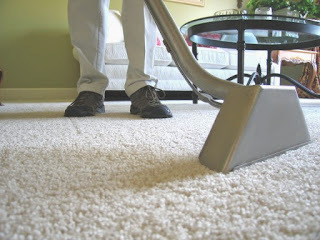 A cleaning agent should be applied to the carpet and allowed dwell time - time to work into your carpet. Dwelling time breaks down dirt and any other substances so they can be removed easily. After pre-spray and dwell time, suspended soil must be flushed from the carpet using hot water extraction equipment. Powerful jets breakdown the suspended soils/spots with hot water and are immediately extracted and removed from the carpet. A heated solution requires less solution, minimizing residue and dry time. Our machine runs at a constant 250 degrees; yet is still safe on all synthetic fibers. Heat can be turned down for wool and other delicate carpet and rugs. The hot water will contain a rinsing agent that neutralizes the pre-spray, leaves the carpet soft, residue-free, and in a neutral ph. This leaves a nearly virgin, soil-free fiber that resists re-soiling much as it did when new. *Contact your local carpet company to find out what services they offer to get the best care for your carpet.